Lots of companies talk about changing the world. At Esri, we’re certainly one of them. But when we talk about changing the world, it’s usually in the context of the technology we create. In recognition of Women’s History Month and International Women’s Day on March 8, we wanted to share one of the other ways we’re changing the world. Esri has had the good fortune and persistence to foster, maintain, and grow a diverse workforce. We enjoy a rich diversity in gender, in race, and even in age. This diversity is intentional, but it’s not an end in itself. Just as our core technology brings together disparate information in a common context to make better decisions, we’ve taken the same approach with our staff. We strongly believe that different perspectives and varied backgrounds can help us build a more competitive, more knowledgeable, and more successful organization. We asked three women at various levels of Esri to share their experiences as veterans and visionaries in the technology industry. Here are their stories. When I participated in high school science fairs in the 1970s, there were maybe a third of us who were girls. We’ve certainly made progress since then, and it’s because we’ve built on the foundation of my generation and the generations before me. Still, as an African-American woman, I often make any meeting or room more diverse just by showing up. 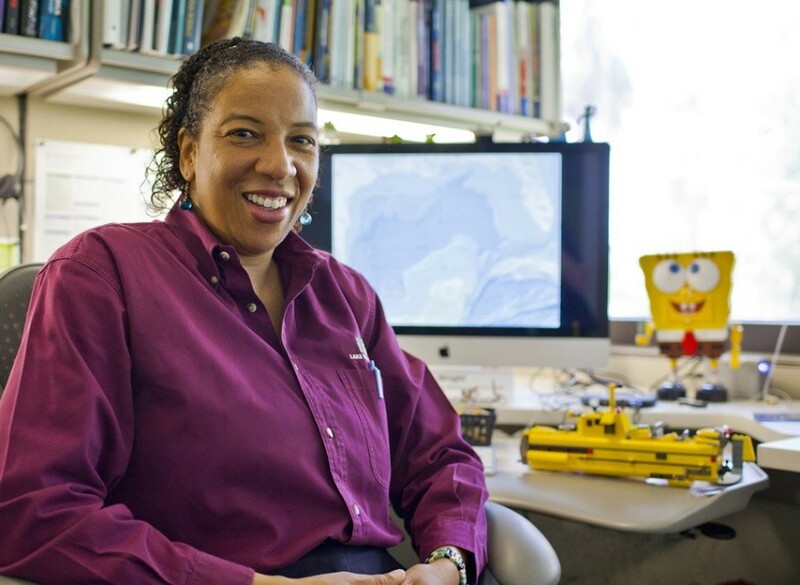 I’ve had many challenging adventures in my life, such as my fieldwork at sea, where I was one of maybe 10 women on an oceanographic research vessel occupied by 100. I encountered some men on these expeditions who at first intimidated me. Many of them had never worked in close contact with women before, let alone for two solid months out on the open ocean. But I’ve found that when you give yourself an opportunity to just sit down with people, you can relate. It doesn’t matter what your background is, we’re people and scientists first. There is no doubt peril out there for women in technology and science fields. We can’t avoid it. But there are really good things that can come from it if we continue to be courageous, if we’re not afraid to be the one, the two, the five, the ten, or the one-half that diversifies a conference, a department, or an organization. We should keep looking at the positive things that can come out of it. In just about every situation, we can come away a winner. This has certainly been my experience at Esri where I have the wonderful circumstance of being able to work directly with Esri’s CEO, Jack Dangermond, and with other Esri directors on strengthening the scientific foundation for Esri software and services, while representing Esri to the national and international scientific community. This work takes me all over the world where I have opportunities to show people how Esri is playing a major role in helping to solve a host of pressing issues facing our planet, such as the continued need for clean water, clean air, protection of endangered species, recovery from disasters both natural and manmade, and better ways to adapt from the relentless impacts of climate change. In my travels I see that women are often not “at the table” as prominently as they should be. But I get to play a small part in changing this, including through participation in such amazing events as the Women in Science Summit at the California Academy of Sciences. We need more and more women to be educated across the world, including in GIS. We can’t afford to miss out on the perspectives, the sensitivity, the experience of half our population! And we desperately need the perspectives of more people of different cultures and ethnic backgrounds, men and women. We need this to guide our educational programs, our research, our governments and our GIS companies! Have you ever been to a technology conference? Did you by chance notice the difference between the long line for the men’s restroom and the nonexistent line for the women’s restroom? It’s a simple example, but it speaks volumes about the lack of female representation at tech gatherings and in the larger industry. 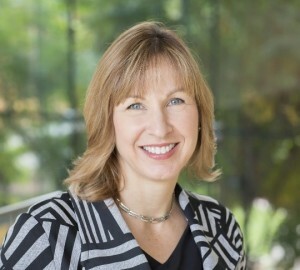 I have been fortunate enough to work at Esri for 18 years, contributing to Esri’s mission to make a difference in our world by communicating the benefits of Esri technology and contributing to the success of our customers. Whenever I gave tours of Esri, I always made a point for them to meet the women who worked in technology at Esri. Especially those in our technical marketing team who are responsible for building breathtaking demos and tech stories. Every day I become more convinced of the importance of mentorship for girls at a very young age. Too often, women sell themselves short when it comes to their abilities to achieve in fields where they haven’t traditionally seen many role models, such as the tech industry. Fathers, husbands, and brothers in any field, and women who have leadership positions in the technology industry in particular, must consciously encourage women from a very young age to participate in this industry and help remove barriers to entry and advancement. Education is the key to enter and advance in a career in the tech industry and any industry. Women must not self-censor when it comes to career choices. Even though I work for a tech company, I don’t always think of my career as a career in technology. We need to expand our thinking about the roles that women occupy in technology companies. I came to Esri because I happened to be in the right place at the right time. I joined as an intern to complete a degree in Communication and ended up with a job offer after graduating. I’ve since learned that GIS offers excellent career opportunities for women since GIS is becoming more and more ubiquitous and is used in every industry. Women bring an interesting perspective to problem solving that, when added to the power of GIS, can yield even more amazing results. In one sense, I’m sorry that we still have a need to keep track of the positions women are holding in the workplace. Wouldn’t it be ideal if we could take such things for granted? That said, I am heartened by the increasing presence of women in science and technology. There are excellent examples of women leaders in this space who are breaking down those real and perceived barriers for all of us. Esri not only talks about making a difference, they actually do it. This is a part of the company culture that attracted me from the beginning. As the company’s first Chief Medical Officer and Health Solutions Director, I’ve been empowered to expand and extend the vision for using GIS in the health and human services market. 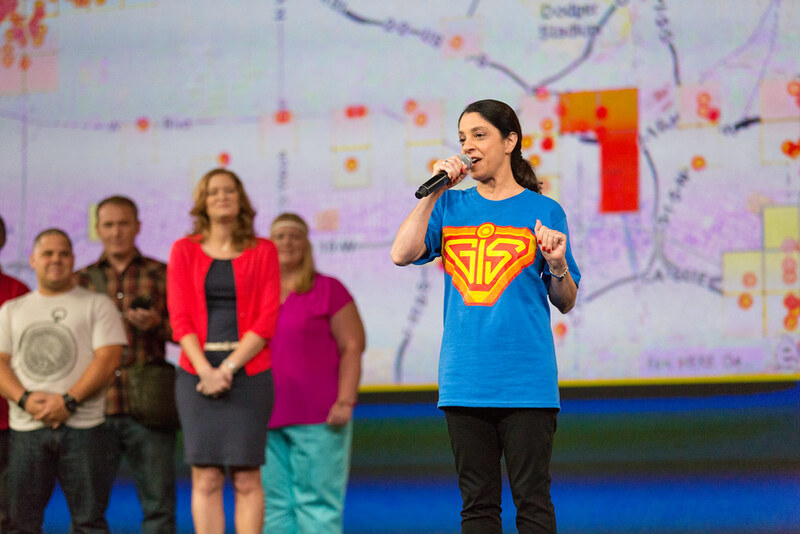 Once folks are inspired, I have the opportunity, in my role, to work with our Esri team and our business partners to help health organizations realize the potential of a location-based platform. My greatest satisfaction is in seeing our health customers achieve their missions when using ArcGIS tools. They are able to improve their decision-making, strategically provision resources, and analyze data in new ways when they put geography to use. Like any citizen of the planet, I want great strides to be made in equitable health access and outcomes for all – and people are doing heroic work to make it happen. While I don’t feel as though I’ve suffered situations like being passed over for a job because I’m a woman, I certainly have dealt with the assumptions that I’m someone other than the leader of the team. My advice for other women would be to first ensure that they have the qualifications for the career they desire. The next piece is to build relationships with people who are in the industry and nurture those relationships. And finally, the best thing I ever did was learn public speaking. Having excellent communication skills goes beyond a formal presentation, but also provides a poise and confidence that positions a person well for leadership. Greater strides still need to be made for women in technology. Although I feel pretty comfortable in this field, it does notably lag behind, in my individual experience, from my experiences in medicine and to a lesser extent public policy. I’m thrilled to be able to integrate my passion for GIS technology with my deeply rooted love of health. 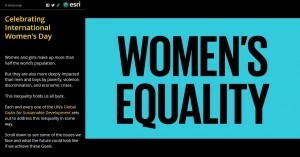 We’re proud to join in the global celebration of International Women’s Day. Here are some fun items you can share for #IWD2016. Our Celebrating International Women’s Day story map chronicles some of the global issues women face and charts a path toward a brighter future. Watch Molokai High School students Sarah and Lily Jenkins own the Plenary stage in front of 15,000 geogeeks at the 2015 Esri User Conference. Are you a woman in tech? Add your name to our story map that features hundreds of women in technology careers around the globe.